Hmmm...that can be read in two very different ways. 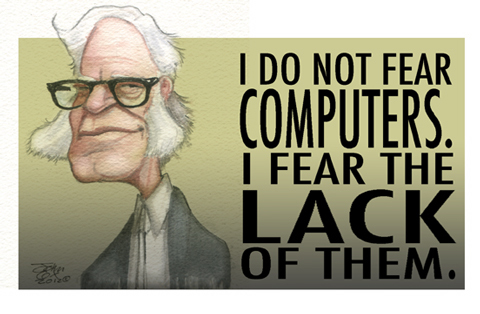 I think Asimov wanted to see PCs invade the darkest corners of world so we can all work from the same page. May have said it before, but it's intriguing how different illustrators are able to exaggerate different features of a person & still capture the person--& from there, I'm able to see similarities between people I never would have considered (for example, "Barry Goldwater with muttonchops"). When I scrolled down to read the comments, I inadvertently stopped scrolling where the top of Isaac's head didn't show. Made me think of a prematurely gray pre-beard Darwin, which made me think of the Infinite Monkey Theorem. I do not fear computers, for I control the power cord and I make a good living off of them. Ka-ching! This page contains a single entry from the blog posted on March 1, 2012 6:08 PM.